My style is a tad bit more elegant than that of the typical 22 year old which makes shopping for me extremely difficult. For the longest time I wasn’t able to find a watch that I felt fit me from a design standpoint. That all changed when I received my Daniel Wellington watch. 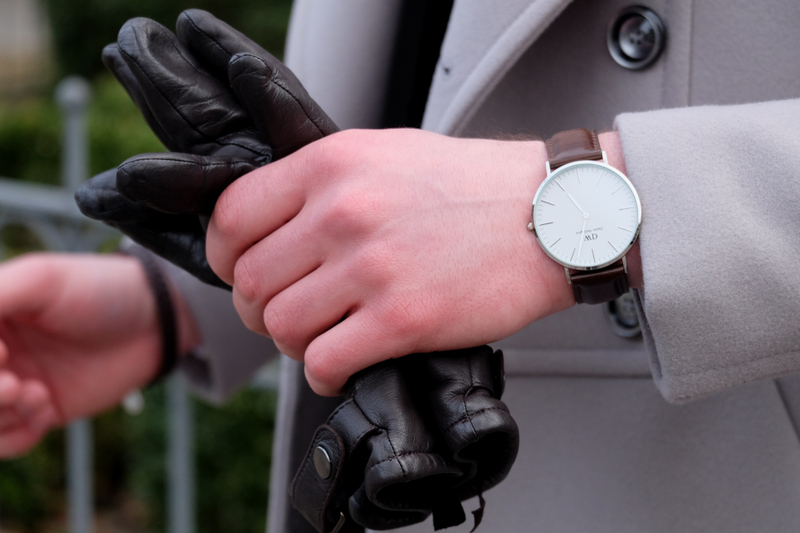 Daniel Wellington is a brand that I’m sure many of you are familiar with. They are becoming very well known in the watch community because of there simple designs that are as versatile as you can get. 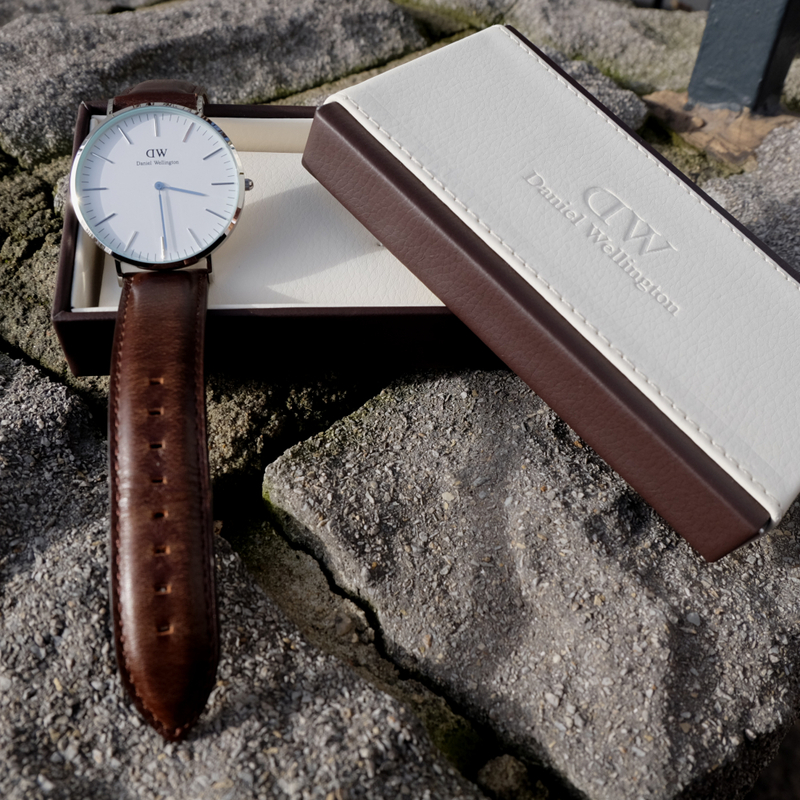 My watch is the Classic Bristol, a silver faced watch with a brown leather band. I choose this one because I feel it represents my style perfectly. It’s a piece that will seamlessly fit into my wardrobe and help me complete outfits for years to come. The best thing about Daniel Wellington is that all their watches have interchangeable watch straps. 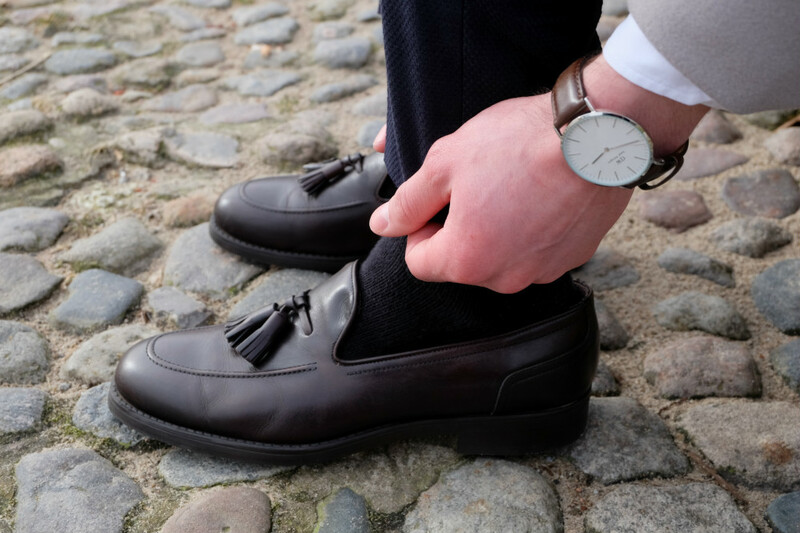 That means that depending on your mood or the formality of your outfit you can change from a black or brown leather strap to one of many colorful nato straps, creating a completely different look. 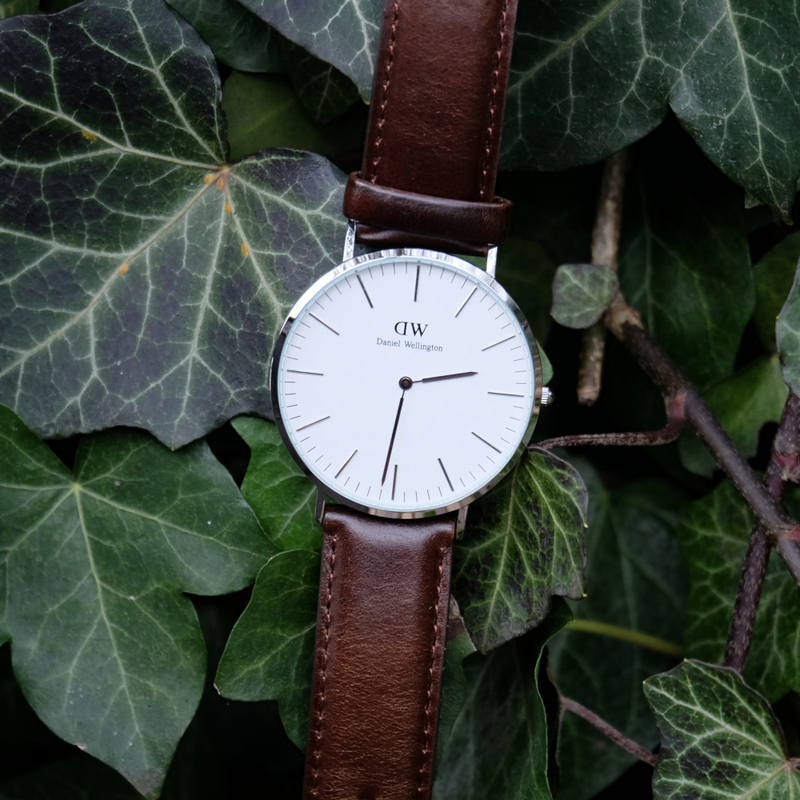 Make sure you head over to danielwellington.com to see all of the great watches and straps they have to offer. Once you’re ready to check out use my exclusive discount code DW_mimosas to save 15% of your purchase. Enjoy! 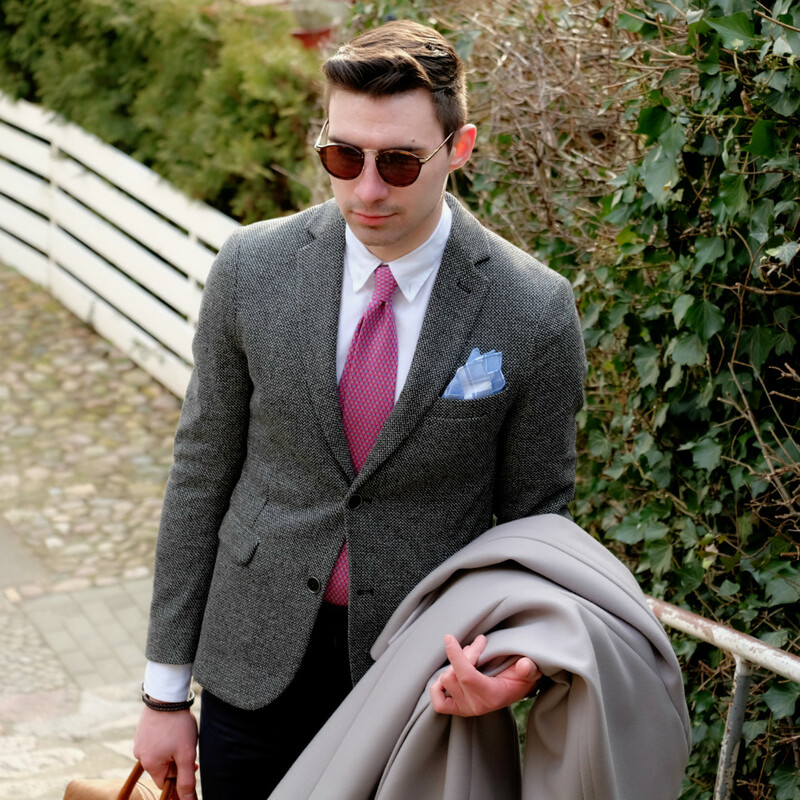 Disclosure: This post was written in collaboration with Daniel Wellington. The opinions expressed are mine alone and are not influenced in any way. 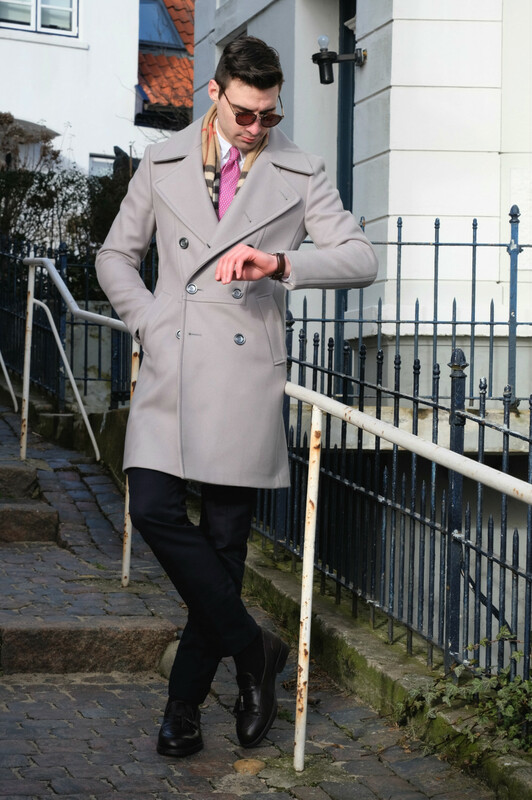 I love the pink scarf against the grey blazer and overcoat Justin! Gorgeous loafers too!! WOW! Love this look! The coat is amazing. 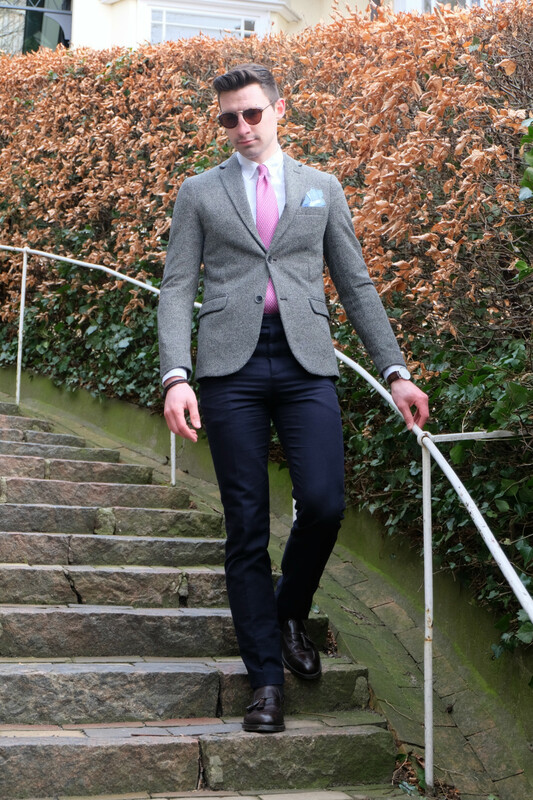 I wish more man would dress so elegantly. I mean casual clothes can be fun, but they too get boring especially when one sees them all the time. Even what is considered professional (a typical suit and tie) is often boring and it really shouldn't be. 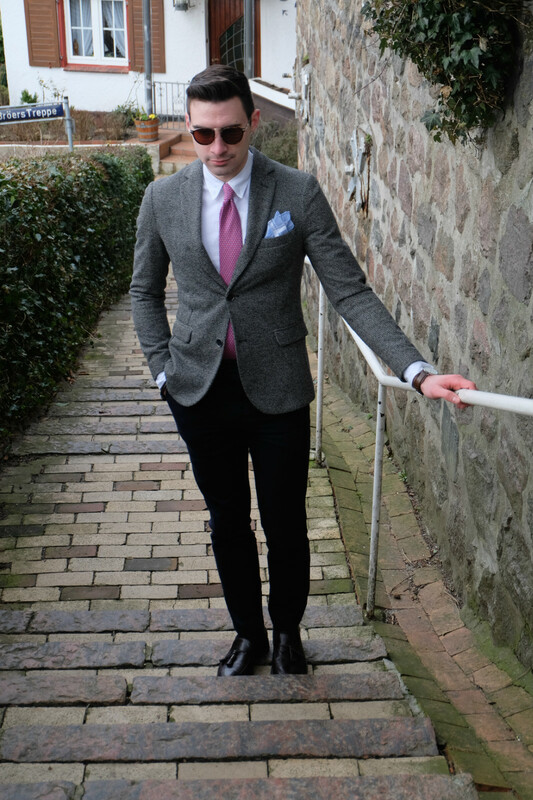 Just something simple, like a choice of a bold tie can make a lot of difference. It is so refreshing to see looks as well put together as yours always are! Your outfit is overall fabulous. The watch matches this look wonderfully. 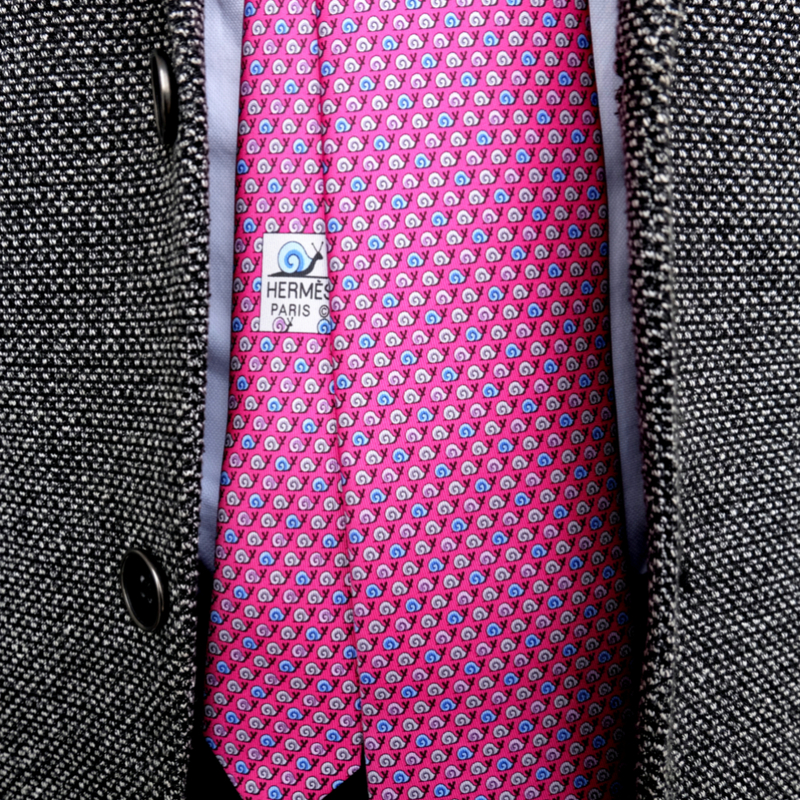 I especially like the pink tie and how it sorts of clashes with that tartan scarf but in such a good way. 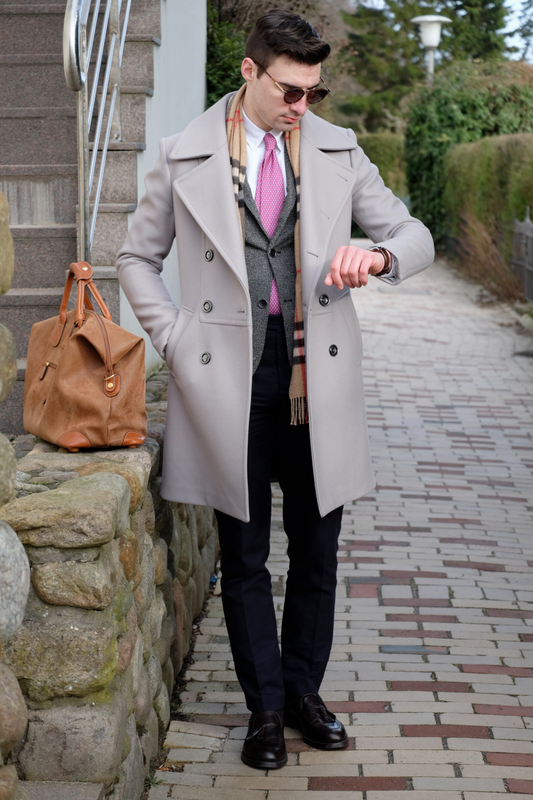 The coat and the bag are pure perfection. sempre molto elegante!!! bellissimo il DW!!! Very nice look!!! Que elegante!!!! 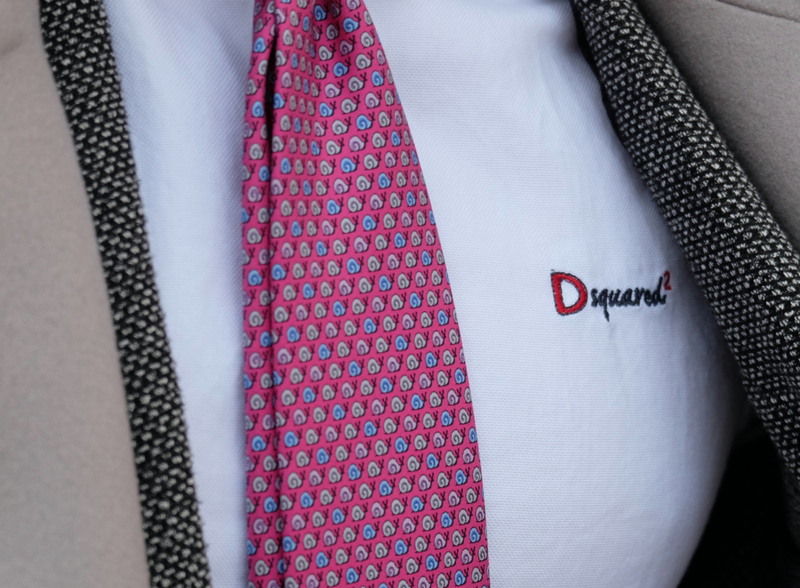 Amazing tie and the D.W. watch is the chic touch!!!! I'm totally in love with your coat. So english style! Thanks for your comment Justin! I've been thinking to buy a pair of Daniel Wellington watch for myself and I guess it's about time to do it! Oh, I love this, hun! Makes me smile, and the watch is on point! I love that you put effort in your outfits, there are not many men who do that. You're always smart and dapper, I think you should be an inspiration to others out there. 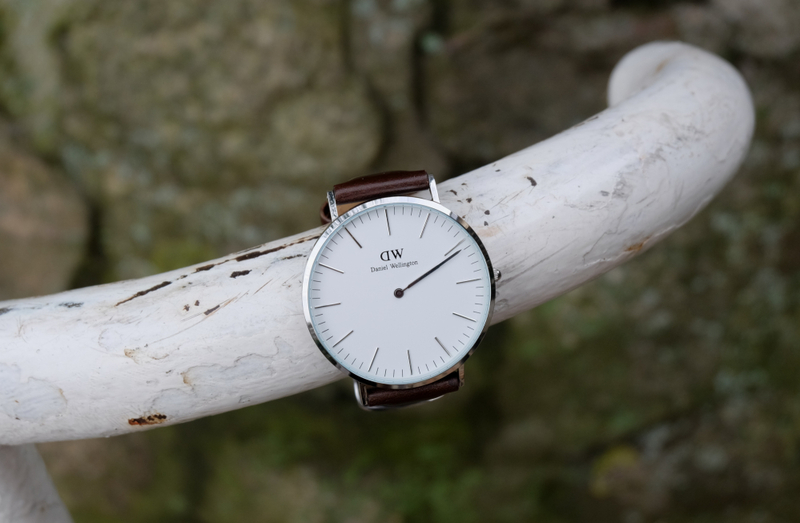 Daniel Wellington has great watches, I love how the designs are timeless. You look great!! !L) I like your outfit!!! 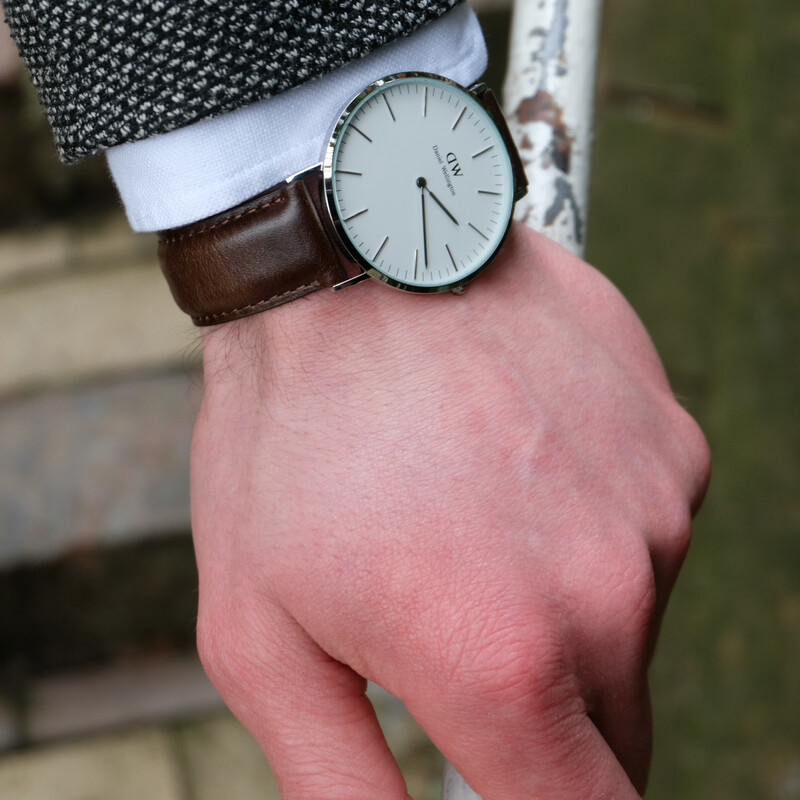 Your photos capture this look brilliantly and the watch is classic. Perfectly styled! What an incredible look! So, so stylish. And I love Daniel Wellington. How I wish all 22 year old will dress like you! Great choice of watch! So stylish. Perfect accessory and finish for your classy outfits! Like always a very handsome guy! 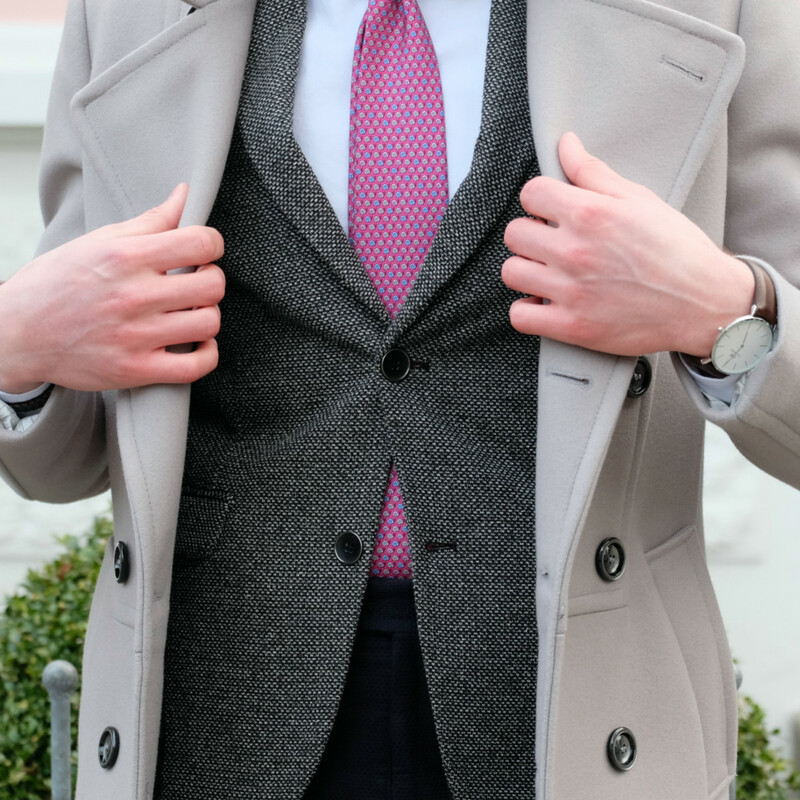 Love the tie & pocket scarf detail! Amazing chic Look! Loving your DW Watch! You are beautiful and stylish man! 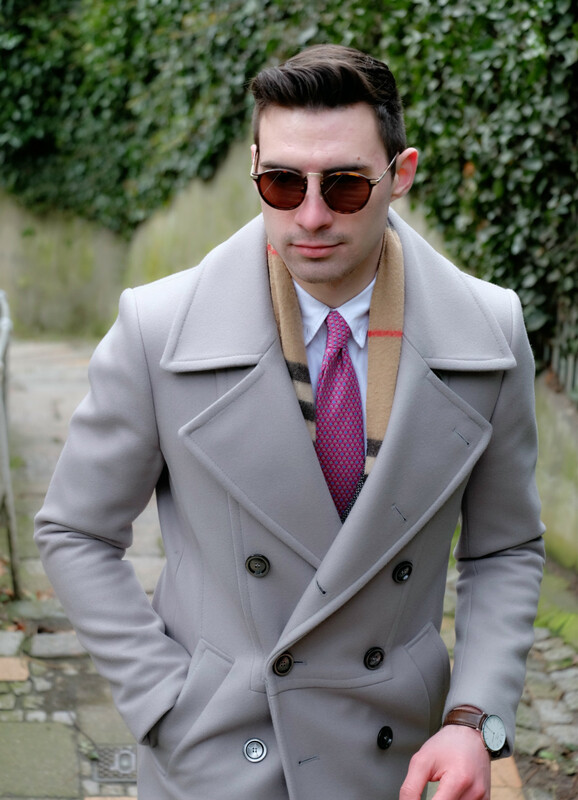 Check out my New post on My Travel and Fashion Blog about London! New Posts about Hollywood, Beijing, the Provence online..
Great post! Thanks for sharing this to us. Amazing outfit and amazing details, love you style!! You look sooooo fabbbbulous! SOOOO COOOL! SOOOO handsome! LOVe that tie!!! 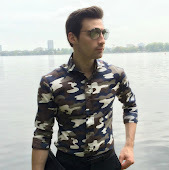 Wenn du magst, schau doch einfach auch mal bei mir auf dem Blog vorbei. You are so smart. I like your long suit.